And then there was one. 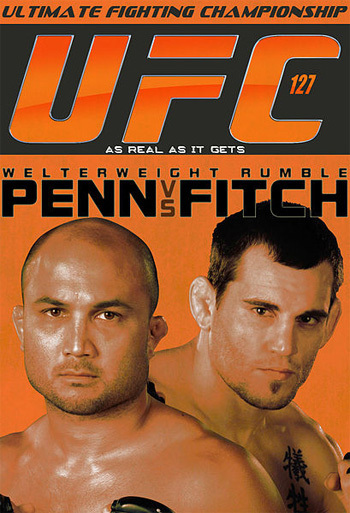 As in one final bout to finalize the fight card for “UFC 127: Penn vs. Fitch.” The February 26th event takes place inside the Acer Arena in Sydney, Australia. A welterweight bout between former champ BJ Penn and Jon Fitch will headline the pay-per-view broadcast. After getting dominated in back-to-back lightweight title fights to reigning king Frankie Edgar, Penn decided to make the jump back up to the 170-pound division. He quickly disposed of Matt Hughes in his last outing at UFC 123. Although Fitch owns an imposing 23-3 resume, 13 of his wins have come via decision. The grappler’s last eight contests have all gone to the judges’ scorecards. He’s won all of them except a lopsided defeat to Georges St-Pierre at UFC 87. Michael Bisping will take on Jorge Rivera in the night’s co-main event. The latest scrap to be confirmed for the record-tying show was a preliminary bout between Spencer Fisher and Ross Pearson.